Press CTRL + D to add the file called frmHuntKilroy.vb from the above folder into your project (or right click on the project and choose to add it as an existing item). To find where the given text is hidden in text files, click on this button. The form includes code to bring up a dialog box. 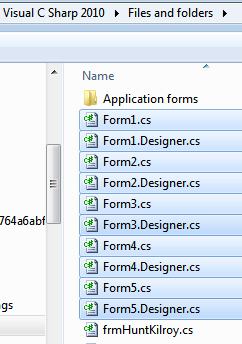 You can then select the files in which you want to search (they're C# ones - apologies) for the hidden text Kilroy. Your version of this message box will include the name of the file, and perhaps even the line number! When your system is working, close down your application and any files that you have open.